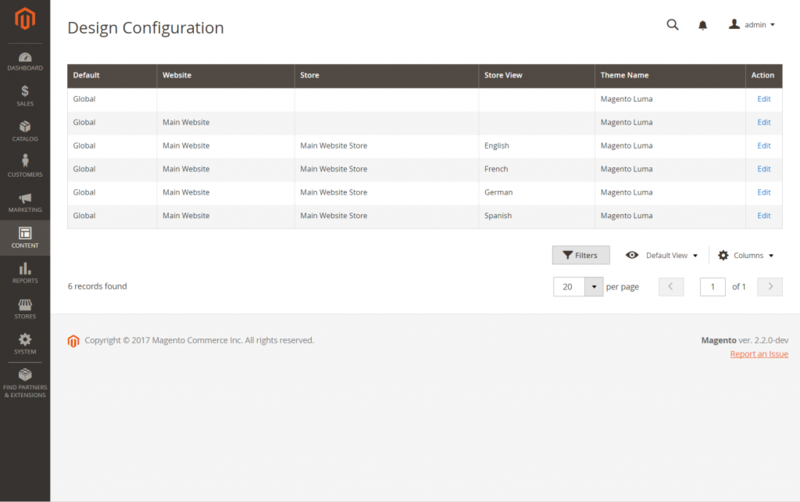 In Magento 2 backend, the purpose of Design Configuration option is to customize anything relate to design and configuration settings by displaying the settings on a single page. In this article, we will show you how to customize the Design Configuration. On the Admin menu, click Content. After that, under Design, select Configuration. Find the store view that you want to configure. After that, in the Action column, click Edit. The page displays the current design settings for the store view. To change the Default Theme, set Applied Theme to the theme which you want to apply to the view. If no theme is specified, the system default theme is used. Some third-party extensions affect the system default theme. Under Design Rule option under User Agent Rules, click Add New User Agent Rule. In the Search String column, enter the browser ID for the specific device. Repeat the process to enter additional devices. Search strings are matched in the order they are entered. Under Other Settings, expand each option. After that, follow the instructions in the linked topics to edit the settings as needed. After complete, click Save Configuration. Above is some basics tutorial about customizing Design Configuration in Magento 2 backend. Feel free to leave a comment or contact email to our authors, if you have any question. Follow our website to get more information and tutorial article about Magento 2.